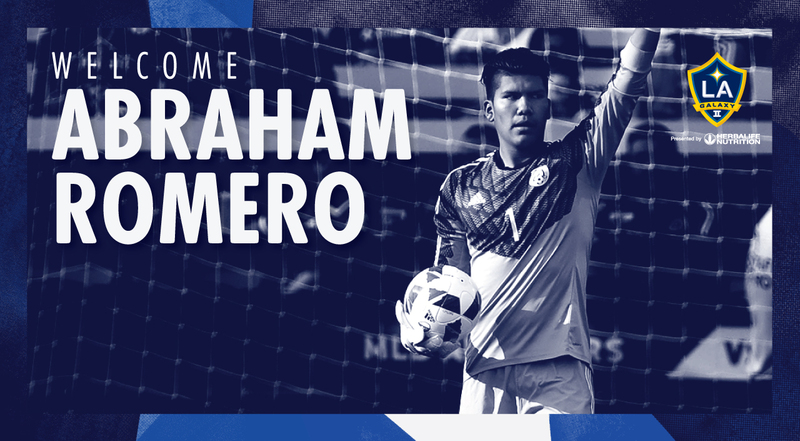 Former LA Galaxy Academy standout and Mexican youth international goalkeeper Abraham Romero returns home to play with LA Galaxy II, the reserve team of the LA Galaxy who compete in the United Soccer League Championship (the second tier of U.S. soccer). “We are very excited to welcome an LA Galaxy Academy product back to his hometown club after spending time in the Liga MX,” LA Galaxy General Manager Dennis te Kloese said in a press release issued by LA Galaxy Communications. Romero, a Pasadena native joined the LA Galaxy Academy in 2012 and in 2016 signed for Pachuca, a team in Liga MX, Mexico’s professional league. Romero said he is happy for the opportunity to be back in Los Angeles with the club that gave him his first professional opportunity, the LA Galaxy, which he considers as the most known team in the United States. Romero, 20, returns to the LA Galaxy after three years with the Liga MX team Pachuca. In Pachuca he shared a dressing room with Mexican veteran goalkeeper Oscar Perez, 46, who Romero said, positively influenced him. Now Romero looks to continue writing his own story as he puts on the gloves in Carson. “I don’t believe in following anyone’s footsteps, we all have our own careers and goals,” said Romero. In the short-term, Romero said he wants to gain the starting position with the LA Galaxy in order to gain the experience needed to represent the first team of the Mexico national team. “I would love to go to [the World Cup] Qatar 2022, said Romero. “Maybe I do not have the experience, but I feel like I have the [talent]”. Romero in the future also dreams in representing a European club-team, as European soccer is considered the highest level of soccer worldwide. “What I would love is to play in Europe, to put the name of Mexico at its highest and also that of the United States because I also feel American, since I was born here and they gave me many opportunities,” said Romero. Romero has the right to dream high, not only because we all have that right, but because it seems as if becoming a professional goalkeeper was destined for him. Romero said when he started playing soccer around the age of 8, he was playing on the field and not a goalkeeper. In fact, he had zero interest in becoming a goalkeeper. Romero said that in a semifinal the team goalkeeper was injured and since Romeo was the tallest one on the team they gave him the gloves. He said he had a good performance and then in the final, he blocked three penalties. After being the hero of his childhood team, he stayed under the three-goal post, something that he feels has been his destiny since an early age. Romero said that at a young age his father wanted to make him a boxer but his mom didn’t like it because it was dangerous so she took him out and put him into soccer. Now both of his parents have shown loyal support to Romero’s soccer career. Now to repay his parents and both countries whom have gave him many opportunities, Romero said he wants to leave his mark in soccer both locally and internationally.